GUEST BLOG: After two action-packed days on the world's largest sand island - British Backpackers Lauren and Fiona spend their third and final day with Cool Dingo on Fraser Island before heading back to Hervey Bay to continue their east coast itinerary. Is it any wonder the traditional owners of Fraser Island called it K'Gari - which means paradise. DAY 3: Another early start. Another breakfast served hot, and with a smile from a very enthusiastic man who told us how much he loved his job. Then, we were back onto the bumpy bus, with our numbers down from 21 to 10. Fraser's fabulous eastern beach highway! After the lake, we then went to Eurong Beach Resort for our free restaurant all-you-can-eat lunch. Yet more delicious food!! 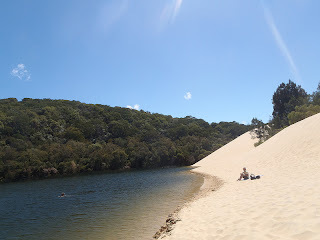 Once we were completely stuffed, we then went back on the bus to Lake Wabby. The bus had to stop about a 45 minute walk away, so we had a good old trek through the sandy forest to get there, but it was worth it! Lake Wabby is an oasis in the sand. We came out over the massive Hammerston Sandblow, which was like we had stepped out into the desert. There was a very steep incline down to the lake, which we were told not to run down as it had actually been made illegal as so many had done it and had fallen and broken various bones! We heeded the advice, and took a leisurely stroll down the sandy slope instead. Team GB beat Team Italia and Team Deutschland to the lake. Hurrah! We had another paddle, and a chillax on the sand, before the long walk back to the bus. It was then back to Kingfisher Bay Resort and down to the jetty to catch the ferry back to River Heads, and then a coach to take us back to Hervey Bay. Laura got dropped back at the Friendly Hostel to stay there for a night before, sensibly, taking a flight to Cairns. We, on the other hand got dropped back at the coach terminal to take our last Greyhound bus of the trip - departing 8:55pm. Arriving in Cairns the next day at 8pm!!! Epic. Read Lauren and Fiona's original Travelpod blog. Have you travelled with Cool Dingo tours and loved it? We'd love you to write about it on Trip Advisor!